Minnesota National Guard’s Arden Hills Army Training Site (AHATS) features a blast-hazard-mitigating curtain wall and thermal entrance systems. Photo by Gilbertson Photography. Photo courtesy Wausau Window and Wall Systems and Tubelite Inc.
A blast-hazard-mitigating curtain wall and thermal entrance system are two of the features that helped Arden Hills Army Training Site (AHATS) earn Silver certification under the U.S. Green Building Council’s (USGBC’s) Leadership in Energy and Environmental Design (LEED) rating system. A military training area of the Minnesota National Guard, AHATS was known previously as the Twin Cities Army Ammunition Plant (TCAAP). More than 16.5 billion rounds of small-arms ammunition were produced there for the Second World War, Korean War, and Vietnam War. Since 1983, the plant has undergone extensive environmental investigation and remediation, including the excavation of approximately 71,868 m3 (94,000 cy) of soil and removal of 90,718 kg (200,000 lb) of volatile organic compounds (VOCs). 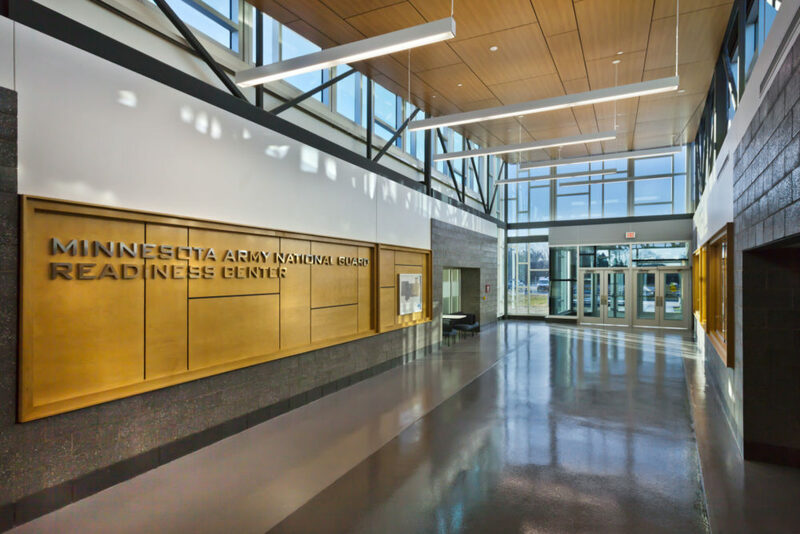 Taking inspiration from the Blackhawk and Chinook helicopters AHATS maintains, architects at Burns & McDonnell integrated helicopter motor and blade motifs into the facility’s design. The new 5946-m2 (64,000-sf), $17-million readiness center consolidates spaces to optimize energy use. Its east-west orientation also takes full advantage of southern daylight exposure, allowing unoccupied areas to power down during the workday. To help ensure a secure space, crews installed 836 m2 (9000 sf) of a proprietary curtain wall system featuring blast-hazard-mitigating windows. Designed to be flexible, the window and curtain wall can withstand a blast load and dissipate its energy. The use of laminated glass also helps mitigate hazards, such as hurricanes or bomb blasts. To help meet its LEED certification, the window, curtain wall, and entrance systems made up of recycled aluminum content, the latter of which helps achieve high thermal performance. In addition, the doors’ durable tie-rod construction and heavy-duty hardware may be further reinforced with steel for maximum strength and dependability. Other energy-efficient features include geothermal heating and cooling and extensive use of natural daylight harvest. The site is estimated to realize an annual energy cost of $0.52/sf, well below the $1.08 Minnesota National Guard average.